Whilst grubbing about the roots of large tussocks of grass at Walton Park, Liverpool, Lancashire on the 15th. November, 1972, in an area of what appears to be long abandoned farmland now reverting to heathy pasture I came across a large number of tiny white silk sacs embedded in the peaty root. On examination I found that each of these contained the Salticid Euophrys frontalis, mostly immature males and adult females. A search in other tussocks revealed similar sacs ranging in number from 3 to at least 15. Included among these were a few sacs of Micaria pulicaria (Sund.) which I know to be a common species here. 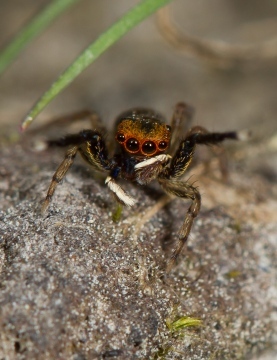 On being extracted from the sacs, the Euophrys spiders were generally quite active and moved away quickly. I had often wondered where this abundant spider and related species disappeared to on cold days and although I expected them to move down into leaf litter and even into the ground itself, it was quite a surprise to find them congregated in this way. The colonial roosting recalls similar behaviour by Oonops pulcher Templeton which I have observed at Hilbre Island, Cheshire on 20th. October, 1971, when over 12 individual sacs containing immatures and adult females of this species were found clumped closely together amongst sand and grass roots.